Born in Florida as one of nine children, Arthur Bell moved to New York to pursue a career in dance. 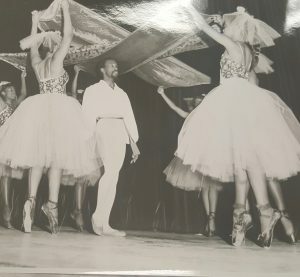 He danced with the Ballets de la Tour Eiffel in France and was the first black dancer to perform with New York City Ballet. In Sir Frederick Ashton’s “Illuminations” he danced in the “Being Beauteous” section. He appeared alongside Jacques D’Amboise, Tanaquil LeClercq, Margot Fonteyn and Talley Beatty; toured in Europe; and had a small role in the Italian film, Anna. He lived as a homeless man until 1998 and reentered the spotlight. He was interviewed by Good Morning America, the New York Times, and the Times of London.